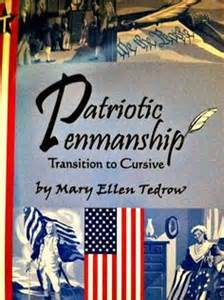 Patriotic Penmanship Transition - What's unique about this handwriting book? You will find both manuscript and cursive on the same page. Parents tell us that their children can write cursive but simply don't know what they have written. In other words they can't read their own cursive. Now your students can figure out how to get to the cursive letters from the manuscript letters. Help them stop being confused. Along with handwriting practice and helping straighten out the confusion, this book will give them good wholesome quotes!